Call us for expert advice and a quotation for your engine machining requirements. What’s so important about the Crankshaft? 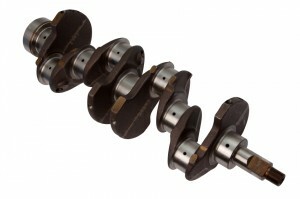 The crankshaft is probably the single most critical component in any engine and must meet an extremely high degree of accuracy.For this reason, regrinding a crankshaft is one of the most skilled jobs performed when remanufacturing your engine.Once reground, your crankshaft will meet the stringent tolerances for journal diameter, ovality, straightness and surface finish as laid down by the bearing manufacturers.Generally, replacement shell bearings are available in under sizes which increase in increments of 0.010” (0.25mm) often to a maximum of 4 or occasionally 6 sizes. When does a Crankshaft need Regrinding? Following bearing failure (usually attributable to loss of oil or oil pressure) you will generally find that a crankshaft will be too damaged to refit with new bearings alone. This will be evident if examination reveals any scoring on the journal surfaces, discolouration of the surrounding material, or any fatigue of the shell bearing surfaces. H T Howard perform this specialised machining operation on our Prince crankshaft regrinding machine. The grinding wheel to be used is selected depending on the width of the journals to be machined and also paying special attention to the size any fillet radii present.Before the grinding process begins the wheel face is diamond dressed and the required radius set. Prior to machining the crankshaft will be cleaned and any oil seal diameters or machined centres checked for damage.This ensures that once in the machine the crank will run correctly between its centres.The crankshaft is then transferred to the machine and mounted at its nose end in an adjustable driving chuck.A tailstock face plate carrying a machine centre is then located into the rear of the flywheel end. Once located, misalignment is checked with a dial gauge and any “run out” corrected using the specially adjustable chuck until the crankshaft is running perfectly in line at both ends.At this point any bend or distortion that has taken place due to stress in the material will be evident. Generally the main bearing journals are machined first moving down the line of the crank from one end to the other.Each journal is finished in turn removing just the minimum amount of material required to clean up at the specified undersize. The con rod (big end) journals are machined after the mains and on the Prince Machine there is a specially designed machining head to achieve this.This machine head is engaged over the journal to be machined and located using a system of adjustable “V” blocks.Once in position and adjusted to the diameter of the journal the head will follow the path of that journal even though it will be rotating around the centreline of the main bearings.This time the journals are all roughed out in turn to within .002” of the required size before being finished to the exact tolerances specified by the bearing manufacturer. During grinding, each journal is constantly measured using a micrometer and finished to the bearing manufacturers specifications.Usually tolerances in diameter are of less than 0.0008” (0.02mm) and often a little as 0.0004”. Taper and ovality will be less that 0.0004” and each journal will be the same as it’s neighbour to within 0.0003”. Finally, after grinding the crankshaft journals will be micro-polished before the crank is removed from the machine for final washing. NB.It is the engine builder’s responsibility to ensure final cleanliness prior to reassembly and any gallery or oil plugs should be removed and any oil ways checked to ensure they are clean. Further refinement of the crankshaft assembly can be achieved by having the crankshaft dynamically balanced. Serving customers in Berks, Bucks, Middlesex, West London and surrounding areas for 60 years.